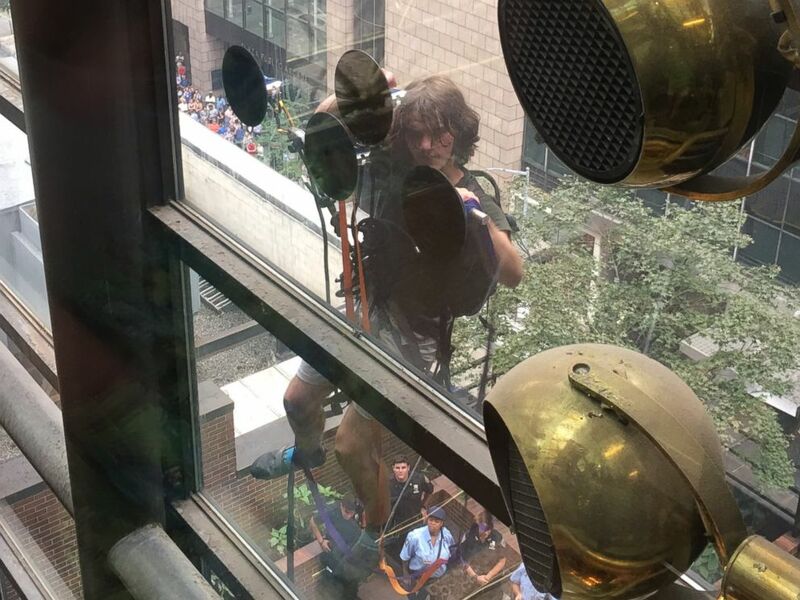 Police have captured a man who tried to scale the side of Trump Tower on Fifth Avenue in Manhattan this afternoon, after an hours-long standoff. 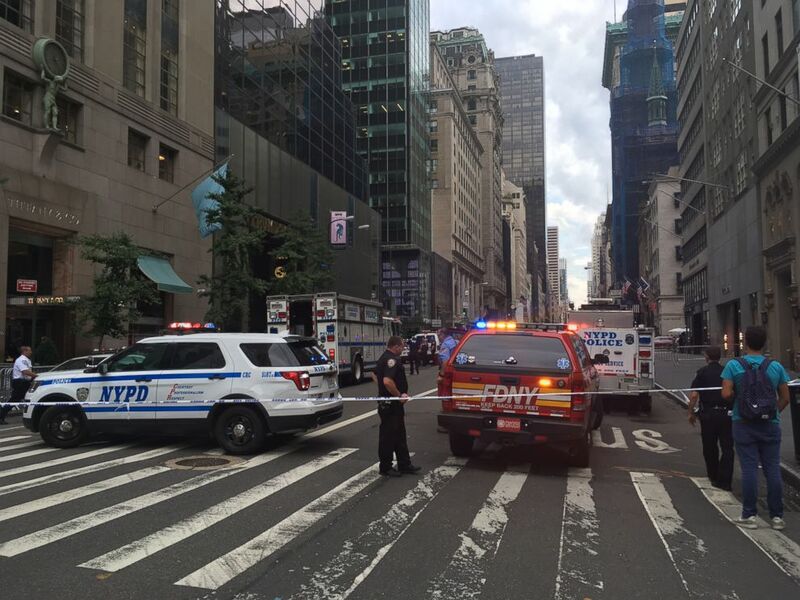 Responding officers yanked the man inside around 6:35 p.m. after knocking out a full window pane on the 21st floor of the 58-story building. Hours after the incident, Trump thanked the NYPD for saving the climber. 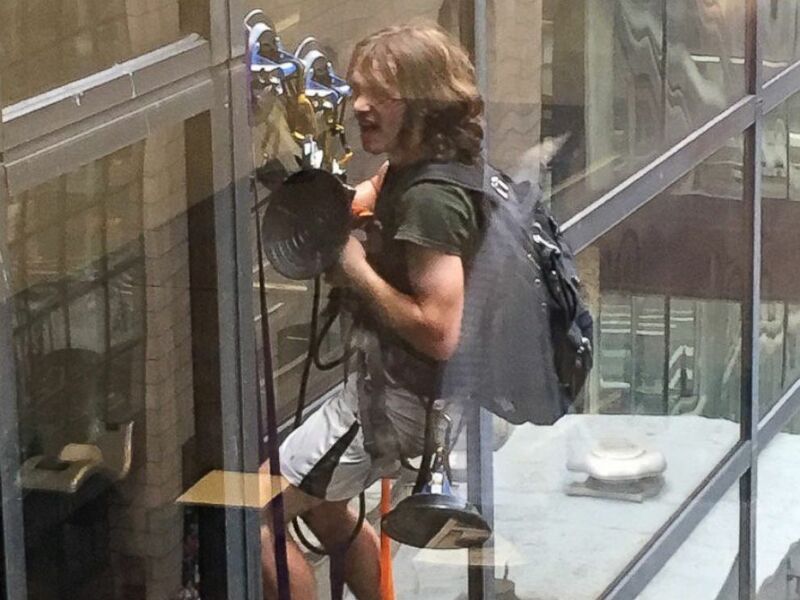 The climber, using a contraption made of five suction cups, scaled the building for over two hours. 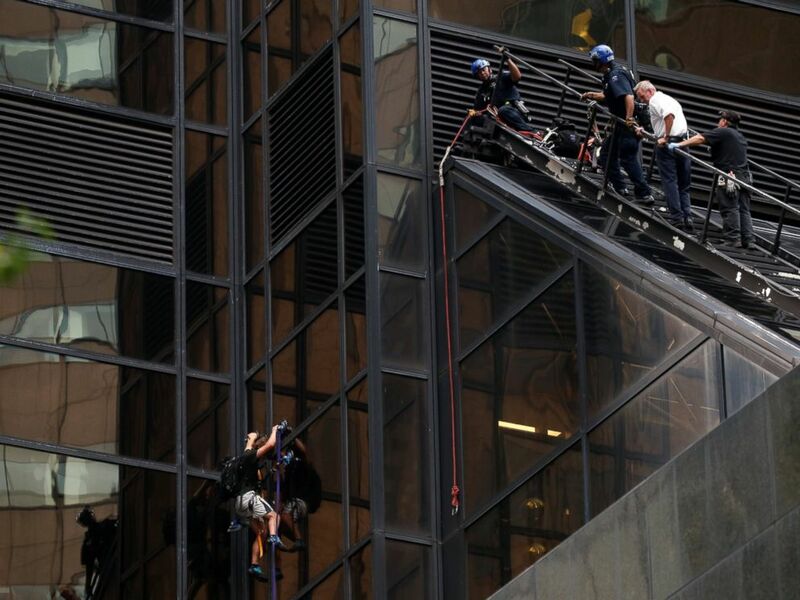 He was removed from Trump Tower on a stretcher. 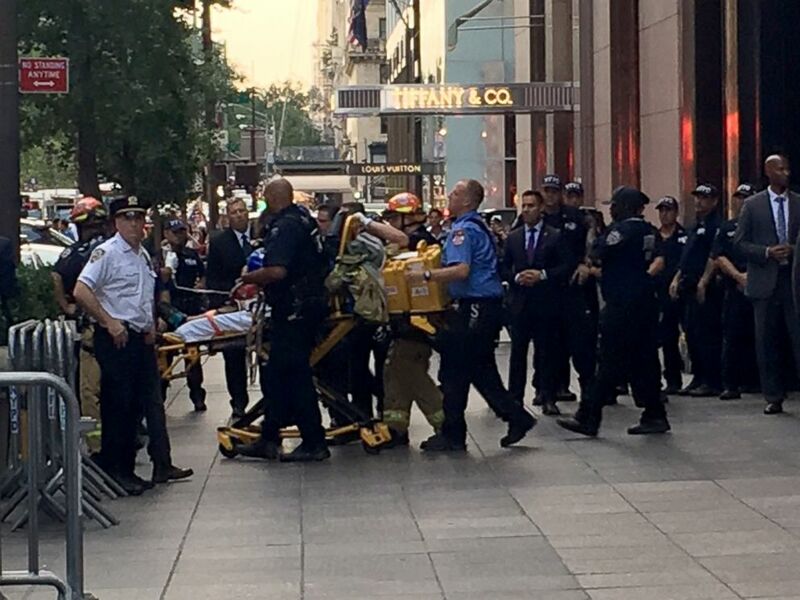 The suspect who scaled the side of Trump Tower in Midtown, Manhattan was removed from the building on a stretcher. 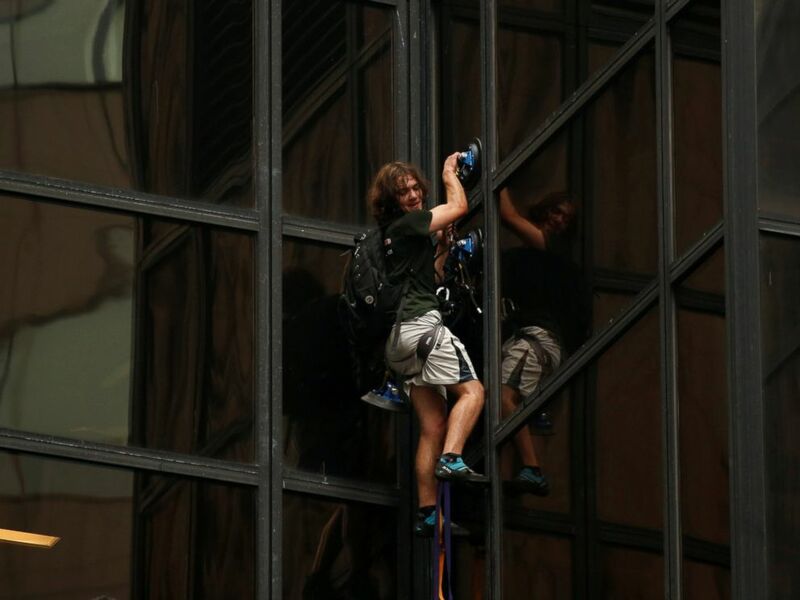 A man climbs the outside of Trump Tower in New York, Aug. 10, 2016. The man started climbing at the fifth floor terrace, which is accessible to the public. it was not immediately clear why he climbed the building, but a police source said he was carrying leaflets indicating the climb was about self-promotion. Police and the fire department responded to the scene and could be seen removing vents and breaking holes in windows of the building. Rescuers also deployed airbags in case the climber fell. The man appeared to change his path at one point, heading sideways to avoid holes that police sawed into ventilation grates, where officers were leaning out. At one point he appeared to be talking to officers through a hole that cops had punched through a window. NYPD emergency services officers were trying to “safely isolate” the climber while talking to him, an NYPD official said, by making it difficult for him to continue climbing. A man was pictured scaling the side of Trump Tower on Fifth Avenue in Manhattan, Aug. 10, 2016. Police were negotiating with him but were reluctant to do anything that could cause him to fall, the official said. The source said there’s no reason the Secret Service will become involved, because there was no apparent intent to harm Trump. Police did not suspect the climber had a weapon, the NYPD official said. "This is clearly a stunt guy," the official said. “The guy doesn’t appear to be here to do anything evil." As the scene unfolded, a crowd formed below on Madison Avenue. Some people cheered the man and whistled. When the climber slipped, gasps could be heard. One onlooker was concerned the climber would slide down the side of the building if it rained. "I thought it was a movie shoot at first," another witness said. Police close down the street due to a man scaling Trump Tower, Aug. 10, 2016, in New York. It was unclear why the man scaled the building. Donald Trump was more than 500 miles away, holding a rally in Abingdon, Virginia, this afternoon. Trump's campaign has not commented on the climber, but Michael Cohen, a Trump Organization executive vice president, said in a statement, "This man performed a ridiculous and dangerous stunt. There’s damage to the building, and he caused the unnecessary deployment of New York’s finest to protect his safety and the safety of everyone in the building. He’s caused the shutdown of traffic on Fifth Avenue. I'm 100 percent certain the NYPD had better things to do. If Mr. Trump were here, he'd be thanking law enforcement for the job they're doing." This story is developing. Check back for more updates.